A regular winner of behindthechair.com's Stylist's Choice Award for Best Lightening System (7 times, including 2009), Blondor Multi Blonde is available as a powder or as granules. Both are multi-purpose hair bleaches, capable of up to 7 levels of lift. Blondor Multi Blonde Lightening Powder is a blue bleach that's fast and easy to mix with anti-yellow molecules to ensure clear results. It produces a beautifully creamy consistency when mixed with Welloxon Perfect in a ratio between 1:1.5 and 1:2. It's available in either a 400-gram tub or as 30-gram sachets in singles or boxes of 12. 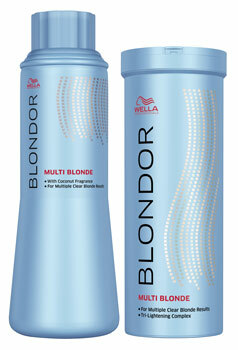 Blondor Multi Blonde Lightening Granules is a white bleach in a 500-gram bottle suitable for all techniques and featuring a coconut fragrance. Again, it's easy to mix and performs superbly when mixed with Welloxon Perfect in a ratio of around 1:1.5.